The new Global Obstructive Lung Disease (GOLD) guidelines advice to focus treatment in Chronic Obstructive Pulmonary Disease (COPD) on improvement of functional state, prevention of disease progression and minimization of symptoms. 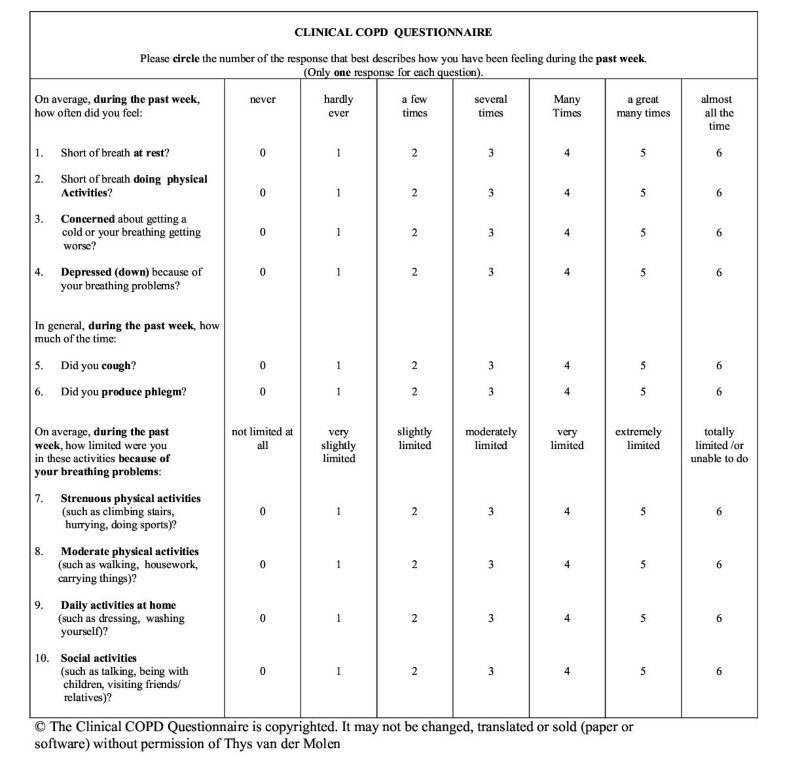 So far no validated questionnaires are available to measure symptom and functional state in daily clinical practice. The aim of this study was to develop and validate the Clinical COPD Questionnaire (CCQ). Qualitative research with patients and clinicians was performed to generate possible items to evaluate clinical COPD control. Thereafter, an item reduction questionnaire was sent to 77 international experts. Sixty-seven experts responded and the 10 most important items, divided into 3 domains (symptoms, functional and mental state) were included in the CCQ (scale: 0 = best, 6 = worst). Cross-sectional data were collected from 119 subjects (57 COPD, GOLD stage I-III; 18 GOLD stage 0 and 44 (ex)smokers). Cronbach's α was high (0.91). The CCQ scores in patients (GOLD 0-III) were significantly higher than in healthy (ex)smokers. Furthermore, significant correlations were found between the CCQ total score and domains of the SF-36 (ρ = 0.48 to ρ = 0.69) and the SGRQ (ρ = 0.67 to ρ = 0.72). 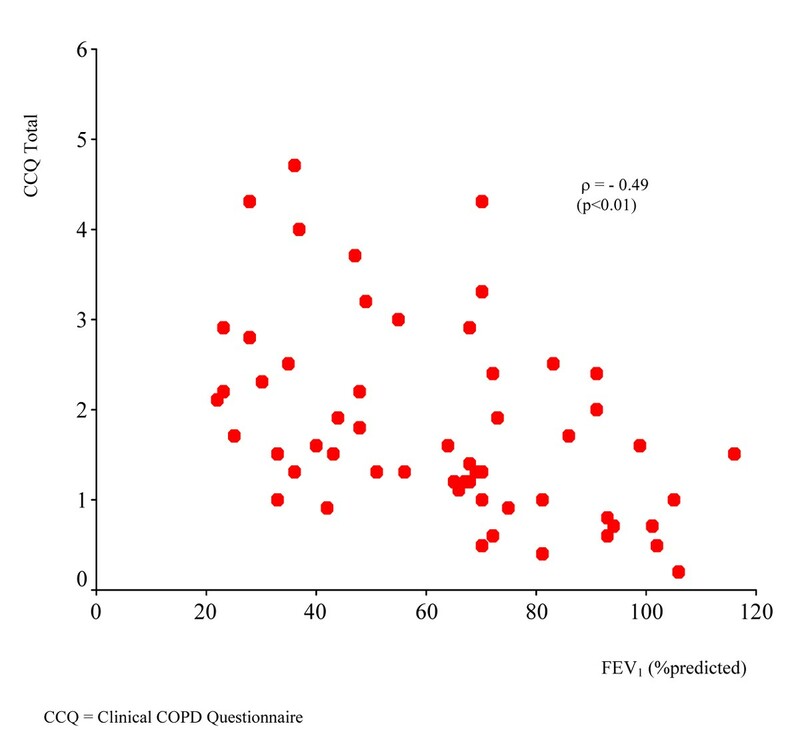 In patients with COPD, the correlation between the CCQ and FEV1%pred was ρ =-0.49. Test-retest reliability was determined in 20 subjects in a 2-week interval (Intra Class Coefficient = 0.94). Thirty-six smokers with and without COPD showed significant improvement in the CCQ after 2 months smoking cessation, indicating the responsiveness of the CCQ. The CCQ is a self-administered questionnaire specially developed to measure clinical control in patients with COPD. Data support the validity, reliability and responsiveness of this short and easy to administer questionnaire. Chronic obstructive pulmonary disease (COPD) is one of the leading causes of morbidity and mortality in industrialized and developing countries. The mortality rate for COPD is rising and COPD will probably become the third leading cause of death by the year 2020 [1, 2]. A study by Feenstra and coworkers showed that there will be an unavoidable increase in the burden of COPD between now and 2015 that is independent from the success of smoking cessation campaigns . In recent years, a great deal of attention has been paid to developing and validating quality of life questionnaires for patients with COPD in order to identify and treat the problems that are most important to these patients [4–6]. Health-related quality of life questionnaires were developed to help identify and treat the functional problems that are most important to patients with COPD. These questionnaires are now being used extensively in clinical trials [7–9]. Health-related quality of life has been defined as the 'functional effect of an illness and its consequent therapy upon a patient, as perceived by the patient' and therefore these questionnaires tend to focus only on the impairments that are important to patients, and often correlate poorly with the clinical status of the airways (e.g. airway inflammation and obstruction) . More recently, the GOLD guidelines have identified the goals of treatment for patients with COPD. These include the patients' goals of improved exercise tolerance and emotional function (health-related quality of life) and also important clinical goals such as prevention of disease progression and minimization of symptoms . Currently, however, there are no instruments that incorporate both the clinicians' and patients' goals as identified by the GOLD committee. 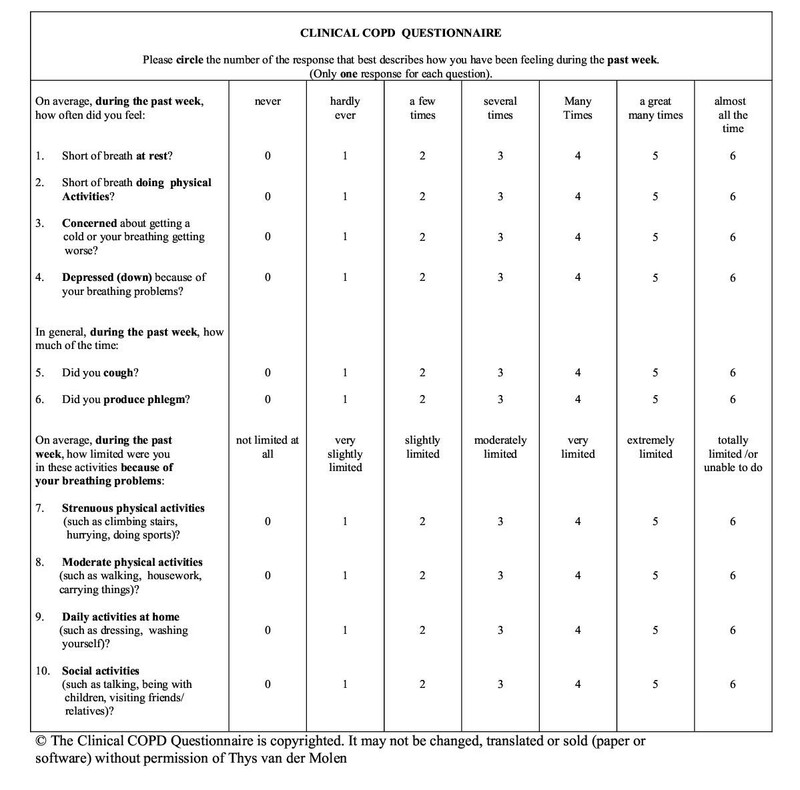 The incentive for the development of a practical health status instrument, the Clinical COPD Questionnaire (CCQ) arose from routine clinical management of COPD in general practice where it was recognized that clinicians require a simple tool that will help them to identify not only the clinical status of the airways but also activity limitation and emotional dysfunction in the patient. It was also thought that such an instrument would encourage clinicians not to focus entirely on the state of the airways and to become more conscious of the patients' functional needs. Although the CCQ has been developed primarily for use in clinical practice, it was recognized that a simple, carefully developed and validated instrument would also be useful in clinical trials and other research studies to evaluate the adequacy of clinical management and to assess the effect of interventions on the overall goals of the GOLD guidelines. The methods used to develop the CCQ were adapted from those used to develop both quality of life questionnaires  and clinical status questionnaires. Clinical control of COPD was defined to include "The full range of clinical impairment that patients with COPD may experience as a result of their disease" . The initial specifications for the CCQ identified that the questionnaire should not only contain the symptoms that physicians consider to be the most important for estimating the clinical status of the airways but also the functional impairments that are most important to patients (physical and emotional function). Therefore, both clinicians and patients played an important role in determining the items that should be included in the CCQ. After the development and pretesting of the questionnaire, the psychometric properties of the CCQ were evaluated. This article describes the development and validation of the CCQ. Interviews and focus group discussions with COPD patients were conducted to collect potentially relevant items for the CCQ. The disease severity of patients in the focus groups varied from mild to severe. Two focus group discussions were conducted in The Netherlands and one in the United Kingdom including a total number of 34 patients. Twelve individual interviews were conducted in The Netherlands. Interviews and focus group discussions were transcribed. The transcripts were read by a team that included the authors TM, SS and two independent researchers. Emergent themes were discussed and used to generate items. Results of the Dutch interviews and focus groups were analyzed in Dutch and then translated in English for further development of the CCQ. To ensure that all possible items were included, we also reviewed other COPD questionnaires, identified treatment goals from international guidelines and consulted a number of clinicians involved in the treatment of patients with COPD. A list of sixteen items divided into 3 domains that might be used by clinicians to assess clinical COPD control was generated by the team. Seventy-seven international clinicians and experts in the field of COPD management were asked to participate in the item reduction phase. Each expert or clinician was sent a list of the sixteen items identified in the item generation phase and asked to rank them in order of importance and to score the importance of each item for the assessment of clinical COPD control (1=extremely important, 5=useless). Sixty-seven questionnaires were returned (87%). The data of sixty respondents could be used for data analysis. The domains functional state (ranking 1; importance 1) and symptoms (ranking 2; importance 1) were considered the most important domains. However, the experts considered the domain mental state (ranking 3; importance 2) also important to evaluate clinical COPD control. Shortness of breath at rest (ranking 1; importance 1) and during exercise (ranking 2; importance 1) were considered to be the most important items, followed by coughing (ranking 4; importance 2), sputum production (ranking 5; importance 2), nightly shortness of breath (ranking 5; importance 3) and fatigue (ranking 5; importance 3). Wheezing (ranking 6; importance 3) and shortness of breath due to emotional distress (ranking 8; importance 4) were ranked as least important items by the clinical experts. Fear of the next exacerbation (ranking 2; importance 2), depression (ranking 2; importance 2) and fear (in general) (ranking 2; importance 2) were considered as the most important items, followed by bad mood (ranking 4; importance 3) and cognition (ranking 4; importance 3). In the item reduction questionnaire a subdivision in three standardized activities was proposed. Ninety percent of the respondents indicated that the activities covered important issues of daily life for patients. Nearly 40% of the respondents had remarks regarding the classification and the description of the subdivision. It was often mentioned that social activities do not fit in the row of strenuous and moderate activities. Respondents suggested to add a category of light activities or daily activities. Another remark concerned the usefulness of the activity hobbies. It was suggested not to include hobbies in the functional state domain because the amount of activity can differ between different hobbies. The symptom domain and the functional state domain were considered extremely important by the experts and were nearly equally ranked. The mental state domain was ranked third and was considered very important. In order to meet the opinion of the experts, we decided to include the four highest scoring items in the symptom domain, four items in the functional state domain and the two highest scoring items in the mental state domain. To meet the specification of simplicity, the CCQ is short (10 items) and easy to complete i.e. it is self-administered (figure 1). It takes patients approximately 2 minutes to complete the questionnaire, and assistance is generally not required. Patients are instructed to recall their experiences during the previous week. A 24 hours version is also available. They respond to each question using a 7-point scale from 0 = asymptomatic/no limitation to 6 = extremely symptomatic/totally limited. The overall clinical COPD control score and the scores of the domains are calculated by adding all the scores together and dividing this sum by the number of questions. Thus, the overall clinical COPD control score as well as the score on each of the three domains varies between 0 (very good control) to 6 (extremely poor control). Data were collected from a study on the validation of the CCQ and a study on stopping smoking in subjects with and without COPD. Subjects were enrolled from notices in the local media, from general practice and from the outpatient clinic. All subjects were current smokers or had a history of smoking. The studies were approved by the Medical Ethics Committee of the University Hospital Groningen. All patients gave their written informed consent. Individuals were defined as healthy smokers if signs of airway obstruction and chronic symptoms of cough and sputum production were absent. In total the data of 119 (58% males) subjects were collected. Their median age was 54 years (range 42–74) and FEV1%predicted was 88 (range 22–132). Table 1 shows the characteristics of the study population. According to the GOLD criteria 44 were healthy (ex)smokers (37%), 18 subjects were at risk for COPD (15%) and 57 subjects had COPD (48%). Severity of COPD in the latter group was as follows: 15 with mild COPD (stage I), 36 moderate COPD (20 stage IIA, 16 stage IIB) and 6 severe COPD (stage III). Healthy (ex) smokers; normal spirometry, no chronic symptoms (cough, sputum production). COPD classification of COPD by severity according to the GOLD guidelines; Stage 0: normal spirometry, chronic symptoms (cough, sputum production); Stage I: FEV1/FVC < 70%, FEV1 ≥ 80 % predicted, with or without chronic symptoms (cough, sputum production, dyspnea); Stage IIA: FEV1/FVC < 70%, 50% ≥ FEV1 < 80 % predicted; Stage IIB: FEV1/FVC < 70%, 30% ≥ FEV1 < 50 % predicted; Stage III: FEV1/FVC < 70%, FEV1 < 30 % predicted or FEV1 < 50% predicted plus respiratory failure or clinical signs of right heart failure. The Clinical COPD Questionnaire (CCQ) was administered to all subjects. Lung function (FEV1 and FVC) was measured according to the ERS guidelines  using dry wedge spirometry (Masterscope, Jaeger, Breda, The Netherlands) or using a turbine portable spirometer (Micromedical Microlab 3300, Sensormedics BV England). The 36 item Short Form Health Survey (SF-36), a generic health-related quality of life questionnaire , was administered to 49 participants with and without COPD. The St George Respiratory Questionnaire (SGRQ), a disease-specific health-related quality of life questionnaire , was administered to 37 patients with COPD (stage I-III). In a subgroup of 20 subjects (15 males; median age 65 years (range 42–74); median FEV1%pred 55 (range 22–105)) the CCQ was readministered after two weeks. At the second visit subjects rated their perception of change in their state of health in comparison with the previous visit, using the global rating of change. In thirty-six subjects who successfully quit smoking (objectified by cotinine measurements in urine) the CCQ and SGRQ were readministered after a period of two months successful smoking cessation. The group consisted of 19 healthy smokers (9 males; median age 50 years (range 45–59); median FEV1%pred 104 (range 78–128) and 17 patients at risk for/with COPD (8 males; median age 52 years (range 46–67); median FEV1%pred 75 (range 33–107)). The total score and the score on the symptom domain of the CCQ were normally distributed. The distributions for the domains functional and mental state were skewed. In the whole study population fourteen subjects (12%) scored optimal ( = 0) in the functional state domain, whereas seventy subjects (59%) scored optimally in the mental state domain. Within the COPD group (stage I-III), 9 % of the patients scored optimally in the functional state domain, whereas 47 % scored optimally in the mental state domain. Cronbach's α was 0.91 for the total score. Internal consistencies of the symptom, functional state and mental state domain were 0.78, 0.89 and 0.80, respectively. Table 2 shows that healthy (ex) smokers had significantly different CCQ scores than patients with or at risk for COPD. Except for the mental domain score, subjects at risk for COPD scored significantly higher (worse) on the CCQ as compared to the healthy (ex)smokers. Significant differences in the CCQ scores were found between the different disease severity stages of COPD. The symptom domain score in patients with moderate COPD (stage IIB) was significantly higher than in patients with mild COPD (stage I) (p = 0.04). The functional state score in patients with moderate and severe COPD was significantly higher than in patients with mild COPD (p = 0.007, p = 0.006 and p = 0.001 for stages IIA, IIB, and III respectively). Patients with severe COPD scored significantly worse on the functional state domain than patients with stage IIA and IIB moderate COPD (p = 0.09 and p = 0.04 respectively). The mental state domain score in patients with moderate and severe COPD (stage IIB and III) was significantly higher than in patients with mild COPD (p = 0.001 and p = 0.04, respectively). CCQ = Clinical COPD Questionnaire; range 0 – 6; 0 indicating best possible clinical control and 6 indicating worst possible clinical control. Medians not sharing a common superscript letter (a,b,c,d) are significant different at p < 0.05 after Mann-Whitney U test. Healthy (ex) smokers; normal spirometry, no chronic symptoms (cough, sputum production). COPD classification of COPD by severity according to the GOLD guidelines; Stage 0: normal spirometry, chronic symptoms (cough, sputum production); Stage I: FEV1/FVC < 70%, FEV1 ≥ 80 % predicted, with or without chronic symptoms (cough, sputum production, dyspnea); Stage IIA: FEV1/FVC < 70%, 50% ≥ FEV1 < 80 % predicted; Stage IIB: FEV1/FVC < 70%, 30% ≥ FEV1 < 50 % predicted; Stage III: FEV1/FVC < 70%, FEV1 < 30 % predicted or FEV1 < 50% predicted plus respiratory failure or clinical signs of right heart failure. The total CCQ score in patients with moderate to severe COPD (stage IIB and III) was significantly higher than in patients with mild COPD (p = 0.006 and p = 0.003, respectively). Patients with severe COPD scored significantly higher than patients with moderate COPD (stage IIA) (p = 0.028). The CCQ score showed significant correlations with all but the pain component of the SF-36 (table 3). The CCQ score was strongly related with the physical functioning component of the SF-36 (ρ = 0.69: p < 0.01). SF-36 = Medical Outcome Survey Short Form-36 (higher score indicates better health status); * P < 0.05; ** P < 0.01, Spearman's rank correlation. Table 4 shows correlations between the CCQ score and the SGRQ scores. The total scores of both questionnaires were significantly correlated (ρ = 0.72; p < 0.01). The symptom domain of the CCQ correlated significantly with the symptom component of the SGRQ (ρ = 0.75; p < 0.01). The functional state domain of the CCQ correlated strongly with the activity component of the SGRQ (ρ = 0.69; p < 0.01). SGRQ = St. George Respiratory Questionnaire (higher score indicates worse HRQOL) * P < 0.05; ** P < 0.01, Spearman's rank correlation. The CCQ scores and FEV1%pred correlated significantly in patients with COPD (stage I-III), with the highest correlation between the total score and FEV1 %predicted (ρ = -0.49: p < 0.01) (figure 2). The correlation was ρ = -0.38 (p < 0.01) in the total group, which included patients at risk for COPD and healthy (ex)smokers. The intraclass correlation coefficient was 0.94 for the total CCQ score. Results of the responsiveness to change of the CCQ, as tested in the smoking cessation group, are shown in table 5. The CCQ significantly improved after two months smoking cessation. The total score of the SGRQ showed no significant changes. SGRQ = St. George Respiratory Questionnaire. SC = smoking cessation. * p < 0.05. Wilcoxon U test. In this study we developed and validated a questionnaire to measure clinical control in patients with COPD, the Clinical COPD Questionnaire (CCQ). To our knowledge this is the first questionnaire specifically developed and validated to measure clinical success in the management of patients with COPD. The items were generated by literature search, clinicians and patients. Items were thereafter selected on their clinical importance by the world leading clinical experts in this area. Results show that the questionnaire is valid, reliable and promises to be responsive to changes in patients with all stages of COPD. We used established psychometric methods to develop the CCQ . In the first phase, a large pool of relevant items was generated. This phase included in-depth interviews with patients, patient focus group discussions, discussions with health care professionals and a review of the literature on other COPD questionnaires. In the second phase, international experts were recruited to identify the questions that should be included based on their clinical relevance. The high response rate (87%) gives an indication of the perceived importance to develop such a questionnaire. Clinicians were chosen to assist in the final item selection in order to develop a questionnaire that reflects the items that are considered important to measure treatment success in patients with COPD in day-to-day clinical practice. As a consequence, items as wheezing, fatigue, shortness of breath at night or due to emotional distress, fear, bad mood and cognition were excluded from the final questionnaire based on the importance and ranking score of the clinicians. Although the CCQ has mainly been developed for evaluative purposes, this study shows that the CCQ also has strong discriminative measurement properties and can be used in all patients with COPD including patients in group 0 according to GOLD guidelines. The CCQ has been developed to measure clinical disease control, i.e. specific disease-related consequences, like symptoms and consequences on functional and mental state, the full range of clinical impairment, as indicated by patients and clinicians. The CCQ is not intended to assess patients well-being or the impact of the disease on patients' well-being, and therefore the CCQ is not a tool to measure health related quality of life. In contrast, health related quality of life instruments are measuring issues such as the impact of symptoms on health related quality of life. Therefore, the SF36 and the St George Respiratory Questionnaire have been used in the validation process as instruments to measure convergent validity. Moderate to high correlations between the CCQ and the SF-36 and SGRQ were found, supporting the convergent validity. The total score on the CCQ was highly correlated to the total score on the SGRQ. Lung function was used to measure divergent validity. As expected, the correlation between the CCQ and lung function measurement is lower (divergent validity). However, quite surprisingly, the relation between the FEV1% predicted and the total score of the CCQ in patients with COPD was rather high (-0.49) as compared to a priori assumptions (-0.20 to -0.40). The relation between the CCQ on one hand and lung function on the other hand seems to be stronger than presumed by the investigators in the first stage of this project. This finding is limited to the group of patients with stage I-III COPD as measured by airway obstruction. The CCQ scores of the total group of participants were less strongly related to FEV1% predicted. This may be due to the high predominance of symptoms in subjects at risk for COPD (normal spirometry and chronic symptoms). A considerable proportion (37%) of subjects was included who smoked or had smoked yet did not have airway obstruction and chronic symptoms like cough and sputum production. Although we used the term healthy (ex) smokers to indicate these subjects without airway obstruction and chronic symptoms, CCQ scores revealed the presence of respiratory symptoms in these subjects. This finding supports the idea that smokers without chronic symptoms are at risk for developing transient COPD-like symptoms. The CCQ seems to be sensitive enough to detect these early symptoms. To our surprise, CCQ scores were high in subjects at risk for COPD (GOLD stage 0). This finding may be very important for normal daily clinical practice. The GOLD guidelines refer to this group as being at risk for developing COPD (stage 0) and recommend the reduction of risk factors as single focus of therapy. It seems that this group of patients with normal lung function but with chronic symptoms report the same level of clinical control as a group of patients with moderate to severe COPD (FEV1%pred < 50). Subjects at risk for COPD will commonly be treated by the general practitioner, but without proper evidence-based background about how to treat these patients except for the provision of smoking cessation advice and support. It may well be that the CCQ could also be used for research and clinical purposes in these subjects at risk for COPD. The current study shows that the CCQ can be used to evaluate interventions in patients with COPD and in healthy smokers. Whether the CCQ might be used to motivate individual patients to quit smoking needs to be investigated. In patients with COPD defined by the presence of airway obstruction (GOLD stage I-III), the CCQ was able to detect differences in disease severity. Patients with mild disease had a better control of their disease than patients with moderate disease (stage IIB), as defined by level of lung function. This is in agreement with an earlier finding of Jones and colleagues , sharing that once the FEV1 falls below 50% of predicted restrictions to essential activities of daily living become more apparent. Longitudinal data of 36 subjects who successfully quit smoking for two months showed clear improvement on the CCQ. The medical ethical committee did not allow to follow up those patients who were not successful in quitting smoking, thus preventing the comparison between data from individuals who were successful and unsuccessful in quitting smoking. Smoking cessation is the most effective therapeutic intervention in patients with COPD . Kanner et al. showed a clear difference in decline in lung function and number of lower respiratory tract infections between smokers and sustained quitters in a 5 year follow-up study . In our study the CCQ shows significant improvement after two months smoking cessation while scores on the SGRQ, although in the same direction, did not reach statistical significance. The CCQ improvement by smoking cessation was not limited to patients with COPD. Even healthy smokers without chronic symptoms but with a baseline score of 0.6 on the CCQ showed a statistically significant improvement after two months of smoking cessation. Smoking cessation had a positive effect on the variables as defined by the CCQ in a relatively short space of time and showed to be more useful than the SGRQ since its recall time is one year. Furthermore, the SGRQ is not appropriate to be used in healthy smokers. In summary, the validation of the questionnaire shows strong discriminative properties, test-retest reliability and responsiveness. Although the CCQ has been developed for use in patients with COPD, this study demonstrated that the questionnaire can also be used in patients at risk for COPD (group 0 according to GOLD guidelines). Furthermore, the validation study showed that the CCQ is very sensitive for clinical improvement after smoking cessation. We therefore believe that there is an important role for the CCQ in clinical practice as well as in clinical trials. The CCQ is able to identify patients with poor clinical COPD control and will also be able, more accurately than recall, to evaluate the effect of interventions in a standardized way. K.L. Anderson, N.R. Anthonisen, W.C. Bailey, B.J.A.M. Bottema, P.M.A. Calverley, B.R. Celli, K. Chapman, T.J.H. Clark, P.N.R. Dekhuijzen, C. Donner, P.M. Calverley, L.M. Fabbri, H.T.M. Folgering, P. Frith, R.M.M. Geijer, R. Goldstein, G.H. Guyatt, J.E. Heffner, W. van Hensbergen, D. Honeybourne, M. Hyland, R. Hyland, L.B. Irving, C. Jenkins, P.W. Jones, H. Kerstjens, J. Kraan, N.K. Leidy, H. Los, W. MacNee, A.R. Maillé, C. McDonald, K. Nishimura, M. Parshall, R. Pauwels, M.G. Pearson, D.S. Postma, N. Pride, K.F. Rabe, J. Rees, T.E.J. Renkema, S.I. Rennard, R.R. Rolsin, C.F.H. van Rosmalen., R. Ruffin, C.P. van Schayck, M.R. Sears, N.M. Siafakas, I.J.M. Smeele, G.L. Snider, J.H. Strijbos, W.C. Tan, A.E. Tattersfield, H.A. Thiadens, G.I. Town, C.S. Ulrik, J. Vestbo, C. van Weel, J.B. Wempe, G.Y. Wesseling, P.J. Wijkstra, A.A.C. van der Zwan.